To celebrate the 20th Anniversary of Big Carp magazine, this series of books entitled ‘Big Carp Legends’ will encompass the greatest names in carp fishing history over the past two decades. The content of the books in this series will be a mixture of articles from the archives of Big Carp, life histories of famous anglers and original articles specially commissioned for the series and never before published. One by one these books will build into the greatest collection of modern day carp fishing history ever printed; a collection that every serious carp angler will want to own. 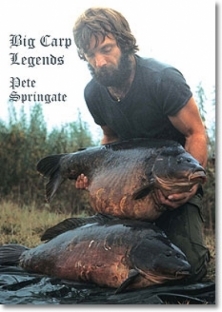 Pete Springate or ‘Sir Pete’ as he is fondly known is one of the godfathers of carp angling. When Noah put two of every creature on the Ark, all those years ago, Sir Pete was one of the two carp anglers. His catches have been legendary for almost forty years. Where he hasn’t fished and what he hasn’t caught isn’t worth mentioning. We all gasped in awe at his picture with the Yeoveney brace on the back cover of Carp Fever way back in the eighties but some would argue that his most memorable brace was that of Mary and Mary’s mate. Not once but twice he has left us amazed. This is Pete’s story of his incredible carp fishing life as told in his own words in 2008. The rest, as they say, is history!